Oil on paper laid on board. Signed and dated 1954 lower right and inscribed verso. Framed dimensions are 24 inches high by 27 inches wide. Georges Manzana-Pissarro was the second son of Camille Pissarro and was also taught by him. He also studied under the architect Ashble. 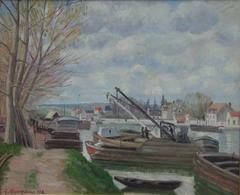 He painted widely diverse subjects, ranging from figures to landscapes, and was particularly noted for his watercolours heightened with gold or silver, in which fish and birds evolved, in the decorative style that was developing from the Style Nouveau of 1900 to the Art Deco of 1925 and then 1930. Unlike his paintings, he did not date them, which would suggest that he drew a distinction between painting, in the strictest sense, and materialistic decoration. He drew particular inspiration from Orientalism. In that same decorative vein, he was active in the creation of objects. Since then, public interest has shifted in favour of his landscapes, which echo the work of his father. He was a regular exhibitor at the Salon des Indépendants in life, and after his death his work appeared in exhibitions on the subject of Impressionism, including in 2003 Impressionism - Nineteen Painters from the Normandy School at the Maison des Arts d'Antony (Hauts-de-Seine). 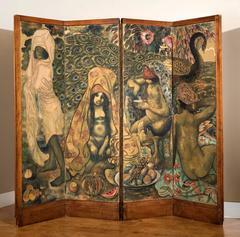 In 1972 the Musée des Andelys devoted a posthumous retrospective exhibition to his work.